A printable is simply a graphic design that is offered as a download. My favorite way to use printables is to simply print and display them on a bulletin board or refrigerator. I especially like to do this with inspirational sayings or quotes. They often serve as reminders or pick-me-ups during the day. For our last printable night, Claire from A Little Claireification, shared a saying about “focus.” I told her I needed to print it and tape it to my forehead! Debbie from Debbiedoo’s is a master at adding her printables to her decor. She uses Mod Podge and applies them to plates and trays like she shows in her post, Dollar Tree Valentine Tray. She’s even been known to add them to poster board that looks like wood! Every time I make a printable I try to imagine it framed and hanging on a wall. If I can do that, then I feel like it will be well-received. Printing and framing printables is such a great way to add DIY art to your home. Here are my printables from December, framed and hung. 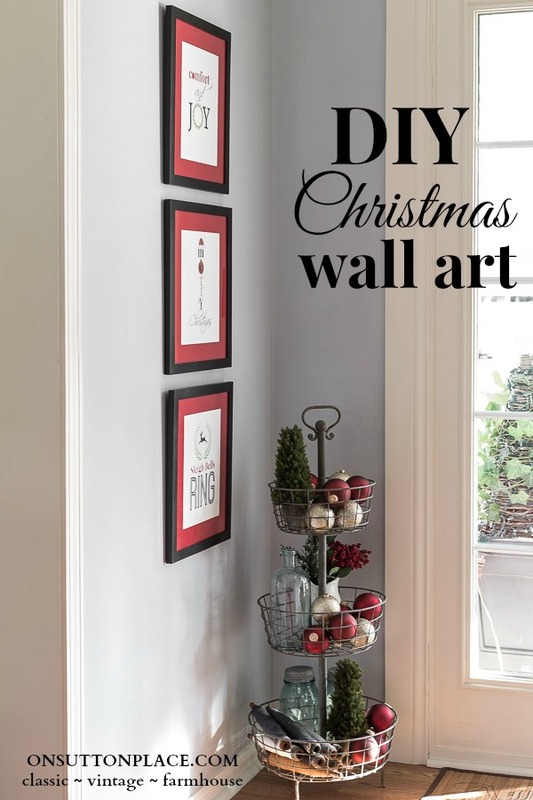 I was able to add Christmas wall art to my entry for a minimal price. The only cost was the mat board and frames…which were all on sale! Jacque, from The DIY Village, frames her printables too. Her printable called “Bushel and a Peck” is perfect in a frame. Just click the link to see what she did. 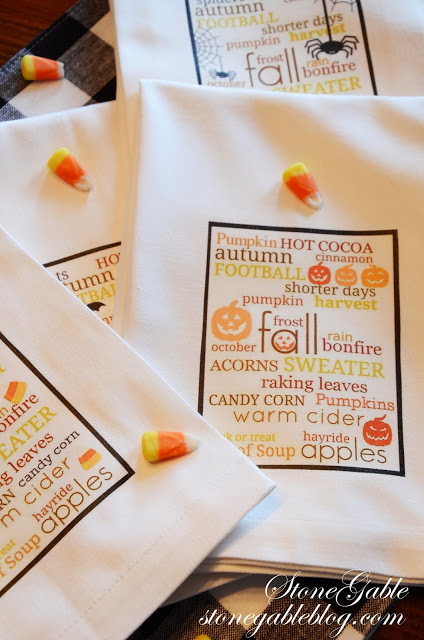 I have never tried it, but printables can be turned into transfers and applied to fabric. 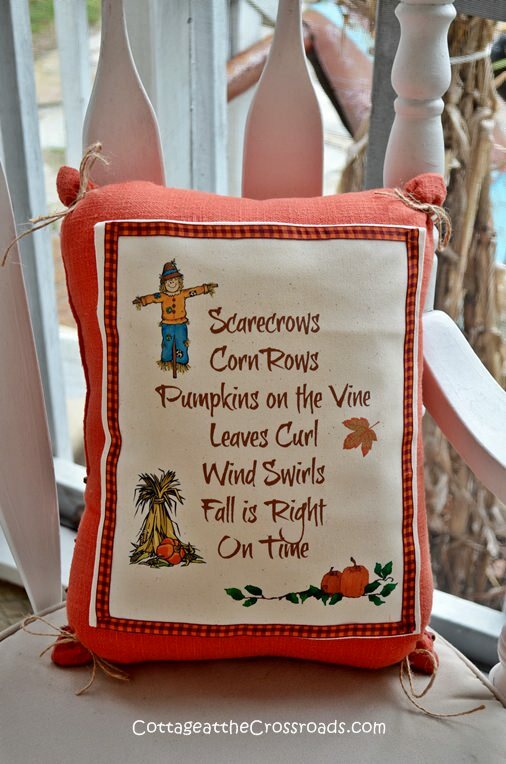 Jane, from Cottage at the Crossroads, shows how to do it in her post More Fall Printables. She ends up making a pillow from the transfer which you can see on her Fall Porch Tour. Yvonne, from StoneGable, used one of my printables to make napkins. She tells you exactly how she did it in her post, No Sew Halloween Napkins. Tags and cards can be made from some printables. A search on Google or Pinterest will turn up just about anything you want. Dawn, from Creative Cain Cabin, publishes tags on a regular basis. Her Christmas gift tag roundup is available all in one post and has something for everyone. Printables can be used to make gifts too. Vanessa, from Tried & True, shows how to make a magnet from one of her original designs. 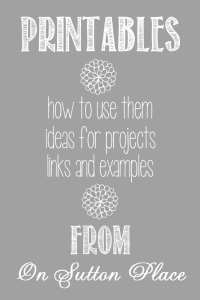 Once you find a great tutorial like this one, you can use it to add your own spin to the project. Handmade items make the best gifts. Right now, as part of the whole New Year resolution thing, checklist printables are readily available. You can pretty much find a checklist for anything! Last spring, my daughter and I hosted a bridal shower that turned out to be a bigger job than we originally thought. When the shower was behind us, I gathered all my hard-earned knowledge and put together a Bridal Shower Checklist. Gwen, from The Bold Abode, has organization checklists available as part of a series called No More Chaos. She’s got you covered morning, noon and night! 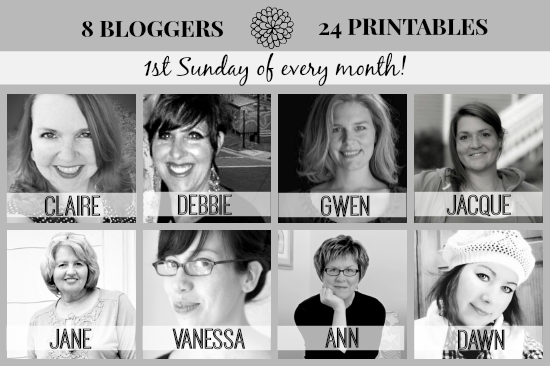 Like I said at the top of the post, you can find printables for free and the best place to do that is on the first Sunday of every month right here on my blog. 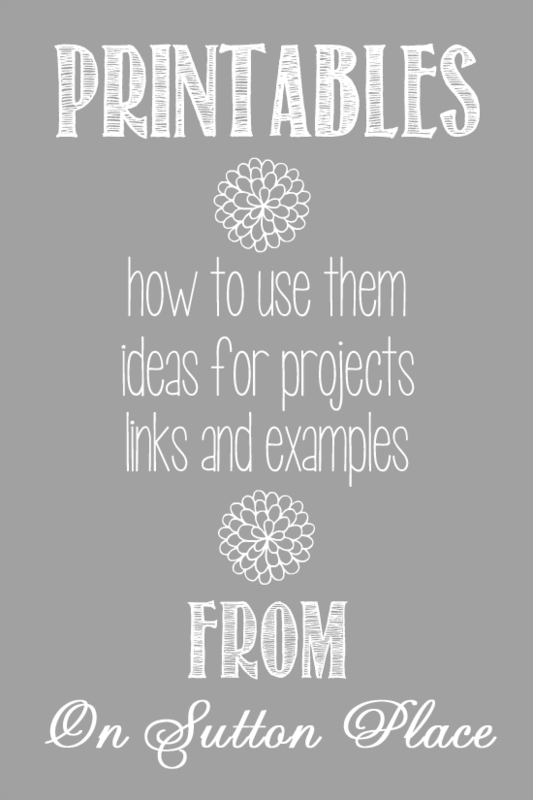 I have teamed up with 7 other bloggers and we each make 3 printables to share, once a month. We go live at 8 p.m. EST. You can get to all 24 printables from here. Another great place to find them is Pinterest. Take a look at my Printables by OSP and then browse around for other options. 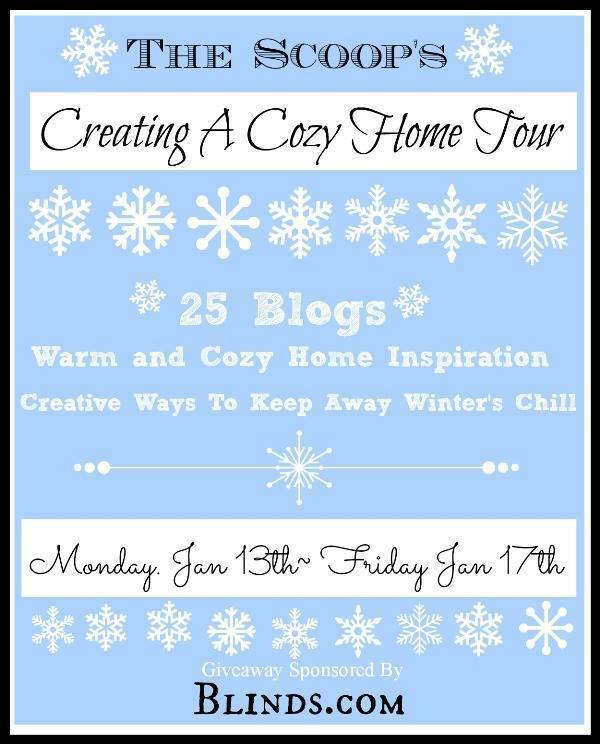 I’ll be back tomorrow as part of a tour called Creating a Cozy Home. I love your printables, Ann! I’m looking for one for Valentine’s Day! Great pot, Ann! Thanks for sharing my No More Chaos Printables! Thanks for all the great ideas again. I will be trying some of these soon! Thanks for taking the time to put all that info together for us. I appreciate it and I will be trying it soon. You are simply the best! You leave no stone unturned and I truly appreciate all the information you share with us…especially us…the newbies. Thanks for compiling this info Ann! Great tip about purchased graphics, too. Sharing and pinning now! Jane, I follow you and Ann everyday…love your blogs and recipes too. Thanks for explaining the Wonderful World of Printables to me :D I haven’t use them in any of the fantastic ways you’ve shared here, but I like the idea of displaying them (and rotating them out) in our kitchen. Some of them are funny, and I also like the inspirational ones, too. Good tip about the ones I can buy on Etsy, too. Thanks so much, Ann! It’s nice to know that I’m not the only one who benefited from this post. I appreciate it so much! Very useful information. I’ve downloaded a couple of printables but have yet to do anything with them. Thanks for sharing. Great explanation and I had forgot about printing them on fabric. I love printables. I have one frame that I use, and just rotate the printables, as the season or my mood, changes. Thanks for sharing. Fantastic Ann! Simply fantastic. Thanks for putting this out there!